/ All Articles / Growing Potatoes in Containers or Pots / How To Guide & Tips? Tips for growing potatoes in a container. Firstly you will need to allow your seed potatoes or shop brought potatoes to chit, this is what allows them to have some side shoots to branch out and form new clusters of potatoes once planted. To do this simply leave them in a warm light position for a few days / weeks. As soon as you see the chits growing you know your doing it right. Once your potatoes chits have formed, leave them alittle longer for the chits to change colour – they will go a purple / green colour this is when you know they are ready for planting. Simply line your pot / container with the multipurpose compost and plant your newly chitted potatoes half way in the height of the container. Do not let the potatoes see the light as they should always be covered. 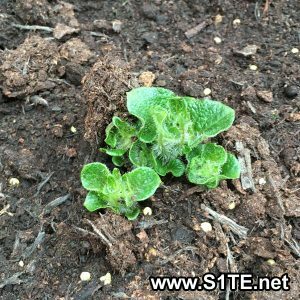 As your potato plants start to grow in their container, they will push upwards in the pot. Simply recover with more multipurpose compost so they are completely covered again. The plant part of the potatoes will grow tall and strong, this is when you know the potatoes are growing well. 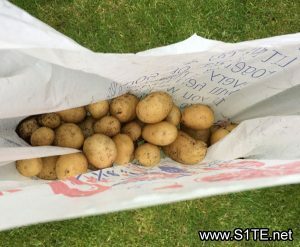 When do I harvest potatoes grown in containers? The main stem of the potato plant will start to wither, not because you have not watered it or it doesnt have enough light – but its to let you know the potatoes are ready to harvest. 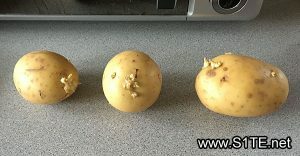 See my photo below of potatoes I have grown in containers from 4 seed shop brought potatoes. Over 2kg worth of potatoes!